welcome the seaside sister property Minimal Blue Villa. Featuring elaborate architectural design overlooking the azure shores of East Attica Greece, this fabulous two level villa in Polytechnic settlement in Chamolia, embodies the ultimate combination of 5 star comfort and minimalist aesthetics.National Technical University of Athens originally selected this area as summer residence properties, thanks to its enviable vantage point looking over the inviting eastern coast and being nestled on a pine-covered slope. At the turn of Millennium a couple of young architects, the attentive owners, planned this ultra modern luxury house perfect for sophisticated families, a few friends or design aficionados.A painstaking work has revived the original values of post modern architecture to its clear form appearance, all the while incorporating exquisite design and restful interiors inside. invites you to experience those sensational views and relax in the lap of luxury at this exclusive hideaway. Overseeing the architectural aspects of the development, this hidden architectural object with great care and attention to detail epitomizes refinement and style. With just five idyllic bedrooms (9 guests) and two spacious living areas, you and your companions will feel truly spoiled by the luxury features and facilities, as you begin to unwind away from the crowds and bustle of large hotels. Either you’re watching the sun as it sets over the adjacent pine forest or rising early to catch the first rays of light spreading across the Attica coast, indulge in breath-taking scenery and a sense of pure serenity. A 100sq overflow pool invites guests to cool off in bliss, while stylish poolside loungers tempt you to relax in the Mediterranean sunshine. A beautifully designed staircase or a tastefully decorated elevator takes you from the luxurious living room/kitchen area down to other unique spaces, which spread across the ground level, while in between you can even find WC with bathtub which alternatively can facilitate the second bedroom, plus a cosy office space. With two utterly wonderful bedrooms – a single room with pool view and a loft and a double room with pool view with a bunk and a loft – plus the equally refined Junior Suite with en suite bathroom, they are perfectly sized for a family. Furthermore, you’ll experience another stunning living space, with a large library and comfortable sitting areas, which will lead you to the outdoor dining table by the pool, for basking in the warm Mediterranean breeze. With lovely garden view, easy access to the patio and a colourful bathroom with bathtub you’re guaranteed total indulgence. Relax and take in the stylist’s dream or don’t miss the chance to drift away in the swimming pool, right at your feet! Inside Minimal blue, another world awaits – as it’s here you’ll find the truly magnificent living spaces, which cover an area of 308 sq. Throughout the villa, exposed marble walls blend with touches of natural wood and top design Italian furniture and lighting fixtures, creating an unmatchable blend of post modern and contemporary ambience. 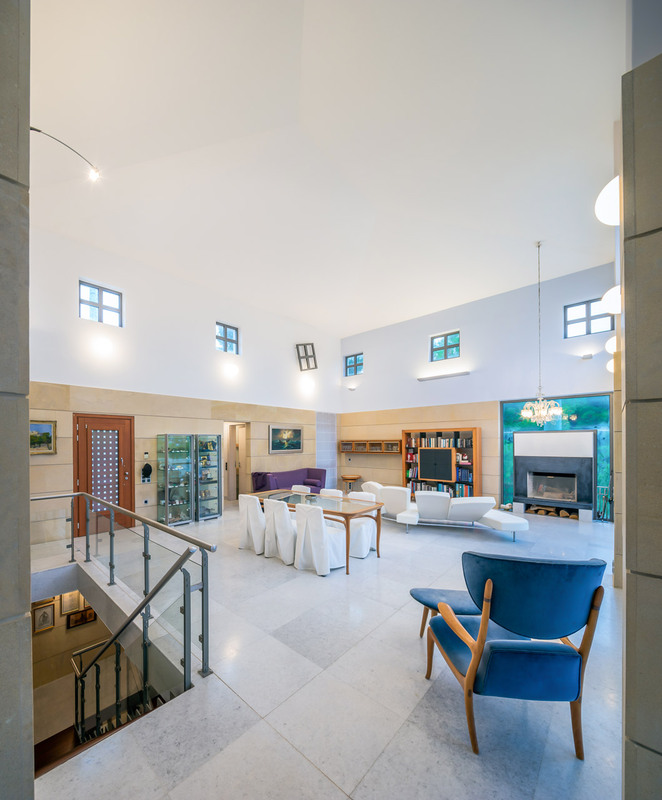 The main entrance of the property on the first floor takes you to an amazing living room, that offers great pool and sea views with a fireplace, two sofas and an armchair scattered around a glass dining table. Discover the Master Suite with spectacular pine forest view and white marble bathroom with shower. 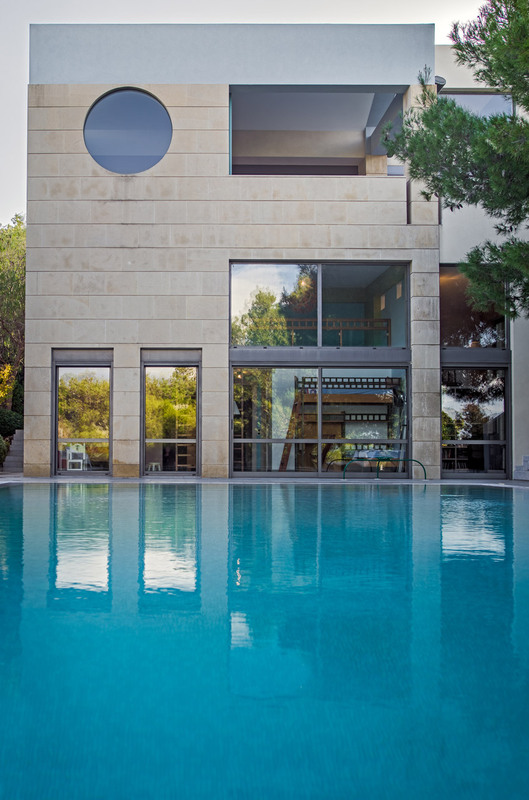 There’s also a fabulous fully equipped kitchen built-in Gaggenau appliances (refrigerator, oven, ceramic hobs, dish washer) offering the greatest pool view, to indulge in sumptuous Greek gastronomy – an intimate space next to the first floor terrace overlooking the sea. As the sun goes down enjoy mouth-watering dishes, paired with a selection of excellent wines! The interior of the two level villa covers an area of 308 sq. The Executive Double bedroom next door, offering sensational forest view and the added benefit of its own entrance, is suitable for a romantic escape for two. The bathroom features a stylish wet room shower and you couldn’t be better located for that refreshing overflow pool! When sensational Mediterranean scenery and beautiful Greek sunshine combine with relaxation, tranquility and exclusive luxury, there can be no doubt that fabulous experiences await you at Minimal Blue Villa.